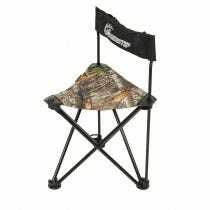 Not only is GrabAGun home to one of the best online selections of hunting, camping, and firearm accessories, we also offer a wide variety of seats and chairs to make your hunting and camping experiences as comfortable as possible. Our vast selection of seats and chairs will improve hunting trips, camping excursions—and, they’re great for everyday use around the house. When you need somewhere comfortable to sit, turn to GrabAGun to find your next selection of seats and chairs to enhance your hunting and camping experiences. There are a variety of reasons to sit in the woods, and whether yours has antlers, a tail, or just the sensation of being in the Great Outdoors, GrabAGun wants to help make you comfortable. One of the basic seat options is a cushion. Lightweight and easy to carry, a personal cushion is the simplest way to keep your bottom cozy when you’re sitting on a log or in a tree. Another efficient way to take a seat when you are in the wilderness is on a stool or tri-pod chair. These easy-to-carry pop-up stools don’t weigh you down as you track your prey deeper into the woods. Many of the seats and chairs from our selection also have practical purpose outside of the natural environment. The ALPS Mountaineering seats are great for stadiums and arenas with no-back support seating. A variety of other stadium seats are also available to improve your sporting event viewing when the seats are hard as rock. Our folding chairs also are great for sitting in the back yard enjoying a warm spring evening. Though we may be known for our vast hunting, camping, and firearm selections, at GrabAGun, you can rest easy deciding to purchase your chairs and seats from us, literally. Enjoy exactly the style of seating you need with one of our numerous options.